A feeling of safety is essential for mental health and well-being, but this feeling can be hard to connect with for some of our clients, especially those with trauma or significant anxiety. 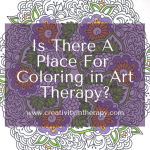 Art therapists are likely very familiar with the directive of drawing a safe place. Most of us learned it in graduate school and some readers may use it regularly with clients. 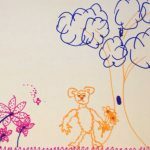 However, sometimes it helps to have a reminder of some of our common art therapy directives, as well as explore why and how they are helpful. I also thought it would be interesting to explore some of the variations on this exercise that I have come across and tried. These variations allow us to think about how to best speak to the needs or struggles of our individual clients. 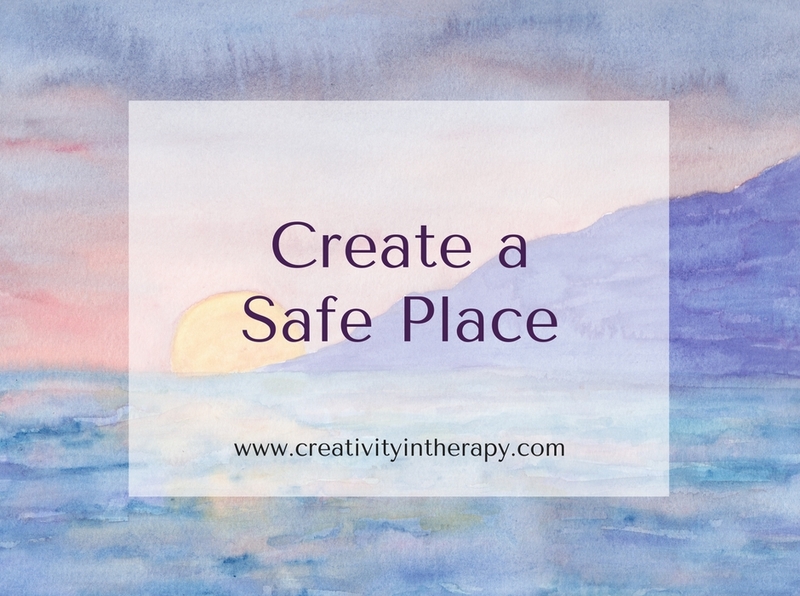 If you are not as familiar with this activity, here are a few thoughts on why safe place (or a peaceful place) art can be helpful for clients. Imagining a safe place can be relaxing and calming for people who are anxious, stressed, or traumatized. When you feel overwhelmed or triggered, you can then internally return to the safe place as a way to self-regulate. Many kids that I work with also find it helpful to imagine their safe place as a way to calm down to go to sleep. Although identifying and imagining a safe place can be done with a guided imagery exercise, through conversation, or as a journaling prompt, art can bring additional depth to the experience. The visual and experiential aspects of the art process can help the client to more fully realize their safe place and better get in touch with the feelings of safety and relaxation. 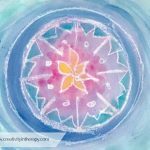 In addition, some clients have trouble with visualization or feel adverse to guided imagery and meditation, but are more able to engage in the art. 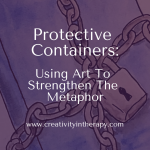 Others are unable to relate to feeling safe themselves because of the level of trauma, but can engage in this experience through the separation and distance of a metaphor. I also find that the ongoing reminder provided by the final product can be very helpful for some of my clients, especially kids. Although most artwork is kept at my office during the course of art therapy, the safe place art is one that I often offer to clients to take home. Kids often tell me that they put the art in their room to look at when they need to calm down or feel better. 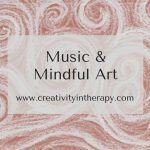 In doing my own art piece for this blog, I was struck by the aspect of creating the safe, peaceful place for myself through the act of imagining and painting. As I worked on the painting, I got to make the decisions and be in charge of what my place would look like. 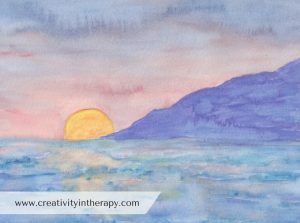 My painting is prompted by a real place where I used to find a sense of peace (sunset at the beach in Santa Monica), but I could alter the image in any way I chose as I painted. 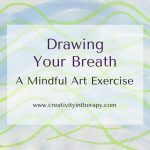 I appreciated the personal agency that is involved in the creative act and the way it mirrors what we are doing internally when we engage in meditative relaxation. In creating a safe place, we can go beyond simply trying to connect with a past emotional experience by painting a memory ,and we move beyond the idea of expecting that our eternal reality must be a certain way for us to feel safe and relaxed. Instead, we are harnessing our mind’s power to create an inner sense of peace, safety, or relaxation, regardless of the circumstances around us. The ability to visualize the safe place and to be fully immersed in the relaxing experience of exploring the safe place can be enhanced by using a guided imagery with clients first. When working with kids and teens I often lead them through a deep breathing exercise and then a guided imagery meditation about walking down the colors of a rainbow. As the guided imagery ends, they are asked to imagine stepping off the rainbow and in to a safe, peaceful place. 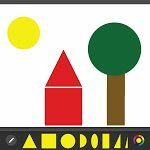 We then transition to the art and they create a picture of the place that they imagined. Imagine looking all around you – up and down, to the right and left, in front and behind – and notice what you see in your safe place. Think of all of the places that you have known that have made you feel safe. Think of things in your life that give you comfort or a feeling of security. You can add these to your safe place. Using your five senses, notice what you can see, hear, feel, smell, and taste in your safe place. Do you need any kind of boundary or protection to feel safe in this place? 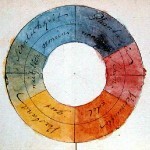 You may also want to help clients better develop their awareness of their emotions and body sensations by asking them either during the guided imagery exercise or after the art-making to notice how they are feeling, both emotionally and in their body as they think about/visualize/witness their safe place. One slight variation of this exercise that I recently read (in Mindfulness and the Arts Therapies) is to have clients visualize and then draw/paint “a healing place.” The guided imagery walks them through moving from a barren, empty place to this place of healing. This version of the exercise was for clients who are dealing with cancer, so the focus on healing is more relevant than safety. Another version I heard recently at a STATA training about military populations is to prompt the client to “draw yourself in a safe place.” This wording change encourages the client to add themselves to the picture. This therapist was using the directive at both the beginning and end of an intensive trauma program, so it also served as an assessment of the clients’ trauma symptoms and ability to connect with a sense of safety. I would definitely be interested to know more about whether this wording change and adding oneself in to the picture changes the impact of the directive for this client. In thinking about what variation of this exercise might benefit your clients, be aware of the wording that use and adjust as needed. Clients will have different responses when prompted to think of a safe place, a relaxing place, a peaceful place, a healing place, or a favorite place. And if it’s been a while since you did this art directive for yourself, I encourage you to make some time to do it again. As I shared above, I had a different experience this time and gained some new insights since the last time that I tried this for myself. It’s a good reminder of why it’s so important for therapists to try all directives for themselves before using with clients and that the value one gets from an art directive can vary from person to person and really depend on your current mindset and life circumstances. 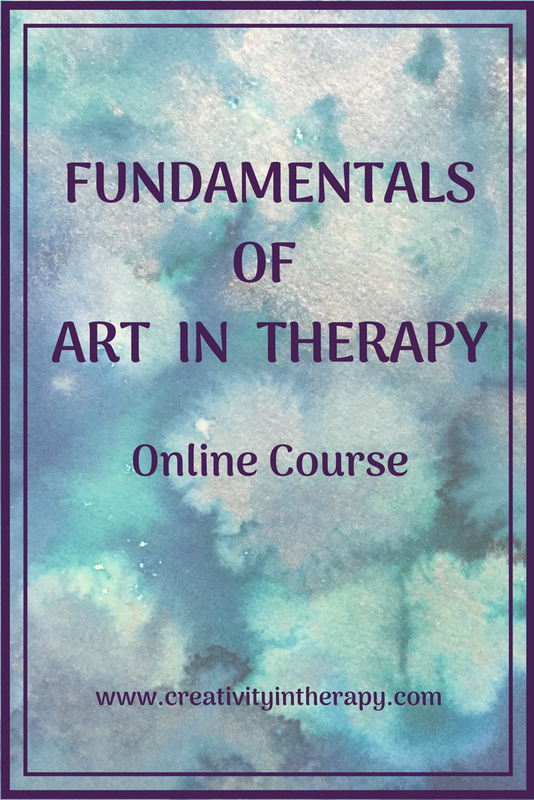 Here are a few art therapy books that I know talk about using this directive, as well as an article and blog post. It’s always good to see different perspectives, ways of using an intervention, and how it is used with different populations. Hi Carolyn ~ I want to let you know how much I enjoy and value your blog posts and ideas! I am a psychospiritual therapist in private practice. 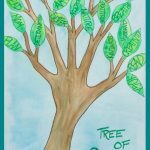 I enjoy such richness in my work – facilitating small groups at cancer retreats at Harmony Hill Retreat Center in Union, WA and several hospital cancer support groups; working with seniors in monthly grief support groups; and teaching/presenting at various retreat centers and senior centers. I utilize expressive arts often (especially journaling and collage!) – and many of your ideas have been treasures in my tool chest! Thanks so much… I continue to share your blog posts and the link to your website with others! Thank you for the kind words, Melissa! It’s always nice to hear that the website is a helpful resource for others. Thanks! Glad to hear that it’s helpful. Could a person have multiple safe places? Can some of those safe places be accessible to man in person and some only accessible to the imagination and minds eye? Definitely! That’s a helpful distinction to make with clients. Maybe they need to identify a real life safe place that they can go when needed, as well as have a safe or relaxing place they want to visualize. For example, I shared my painting of a beach in Santa Monica as a place that I visualize to feel relaxed and calm. However, I live in Texas now, so I cannot go the beach, but would go to a comforting space in my home or garden if I wanted a real space to feel safe and relaxed.